For me, working out at home is a big part of my fitness, and for the most part I’ve got by with just using a standard, thin rubber yoga mat. For cardio training and standing yoga positions the basic mat has been just fine, and perfectly addequate, but where is really lets me down is floor work. As soon as you lie down on the standard mats you realise there’s not much to them other than a layer of grip. This is where the Adidas training mat comes in! This is similar in size to a standar yoga mat, in fact I find it slightly longer and narrower, which better reflects the area of floor space I’m about to use. The mat is around 1cm thick (uncompressed) and has a spongey / foamy feel to it. The top surface is a soft grippy feel and the underside is ridged to make sure it grips to your floor. 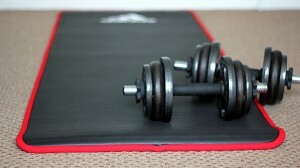 Not only does this mat look the business – it performs well too! Especially for sit-ups and yoga floor stretches. The extra cushioning really provides a lot more comfort for you lower back and spine. It’s a good compromise between the think yoga mats and a high performance workout mat (that would set you back around £100). If you need something with a bit of cushion to it, but can also be rolled up and stored away, then this mat would suit you well. 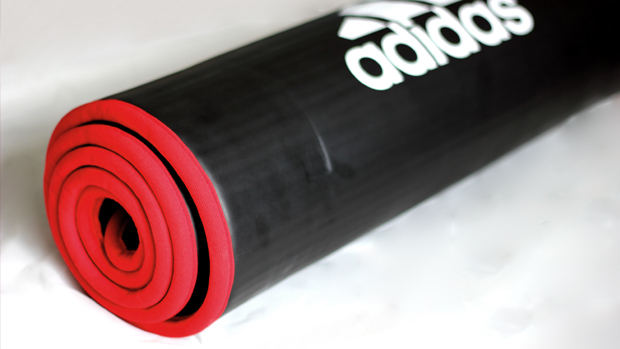 The Adidas training mat is available on Amazon.